Welcome to Western's Department of Chemical and Biochemical Engineering (CBE) web site. I hope that you will take time to explore and learn about our undergraduate programs and other exciting research activities conducted by our professors. Chemical Engineering is a branch of engineering that deals with large scale conversion of raw materials to valuable products using physical, chemical, and biological processes in a safe, economical, efficient, and environmentally-friendly approach. Simply stated, it puts chemistry, mathematics, physics, biology and economics to work in solving real-world problems with new inventions that move the world toward a brighter future. 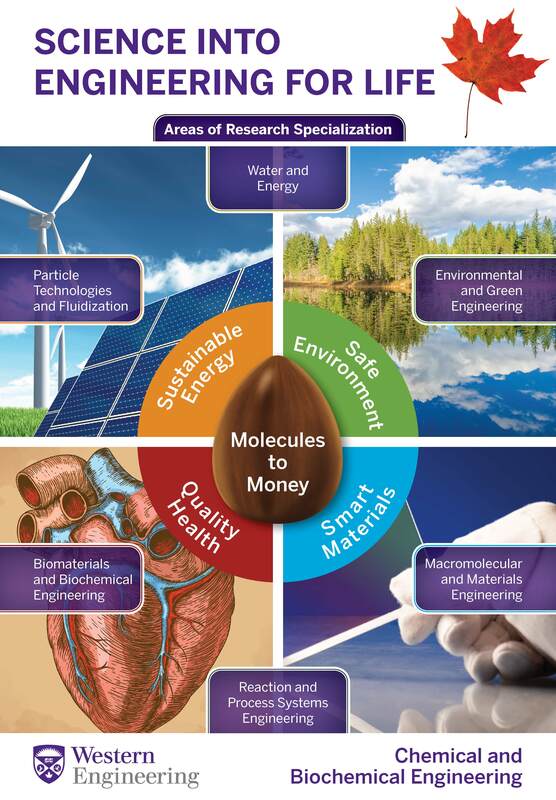 Chemical engineers have helped develop atomic science, polymers, paper, dyes, drugs, plastics, fertilizers, foods, petrochemicals, clean water, waste minimization, reducing pollution, creating new materials, harnessing new source of clean energy, .... pretty much everything. They devise ways to make useful products, can make processes more cost effective or more environmentally friendly or more efficient. As you can see, a chemical engineer can find a niche in any scientific or engineering field. Thus, Chemical engineers sometimes are called 'universal engineers' because their scientific and technical mastery is so broad. Chemical engineers are primarily involved with manufacturing processes, environment and chemical products. Your undergraduate degree in chemical engineering will allow you to develop necessary skills that encompass all aspects of design, testing, scale-up, operation, control, and optimization, and help you find work in such diverse industries as petrochemical, energy, pharmaceutical, organic products, food processing, textiles, composite materials, industrial chemicals such as paints and fertilizers, electronics and biotechnology. Some chemical engineering graduates go on to medical, law, business, or graduate school. If they do, they usually use their chemical engineering degree to specialize - for instance, a chemical engineer with a law degree might focus on patent or environmental law. The diversity of the chemical engineering field indicates that chemical engineers are an integral part of the world industrial hub, and they are responsible to solve the worlds environmental, energy, food, water, health and chemical process problems that make our lives more comfortable and prolific. Our Department is hub for innovative engineering education in both product and process design by integrating principles and practices of chemical, biological, green, and environmental engineering to provide market-ready graduates and technical solutions for a sustainable future. The Department offers two CEAB-accredited undergraduate programs: BESc in Chemical Engineering and BESc in Green Process Engineering. Our undergraduate curriculum emphasizes on the fundamentals of the specific program with innovative and student-oriented teaching and hands-on, real-world laboratory and engineering design experiences for successful careers in diverse process and product industries. It is the department's goal that students will register as Professional Engineers in Canada following completion of the required work experience as stipulated by the provincial licensing body. The objectives are met by providing a sound chemical, biochemical and environmental engineering education with strong design, problem solving and communication skills, so that they are equipped with life-long learning and professional development skills. The program is designed to give students an excellent background in the fundamentals of mathematics, science, engineering, and computational skills, including competence in process design and synthesis, process safety and control, process economic analysis, and environmental assessment of processes and products. The undergraduate program, through appropriate course selection, allows specialization in the environmental, biochemical and green process engineering areas, which have rapidly emerged as important and strategic industries globally. Through a series of specialized technical elective courses, students have the option to enhance their knowledge in new and modern technologies in chemical engineering such as green processes and products, nanotechnology, alternative energy, water and biomaterials. The program is also designed to make students aware of social, ethical and environmental issues, and how the engineering profession plays a leadership role in society. Our Program promotes Engineering Plus education such as dual and combined degrees, certificate options program, industrial internships and co-ops, international opportunities such as student exchange program and WE Go Global, leadership opportunities and accelerated master's program.